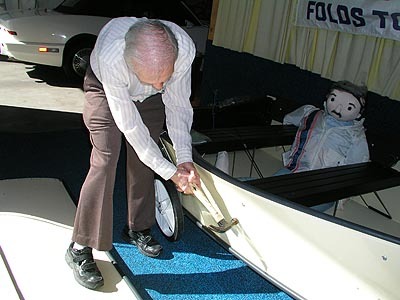 The portability concept was always there, but a a question that many of you might ask is how can a boat be folded not just once, but many times, still have seams strong enough to never leak. This information had remained a secret for a long time and will continue to be this way. What one need to know is this technique is used in the aerospace industry and that this technique involves the complex welding of the 4 pieces together via staple wires and appears to have some type of sealant material injected in-between the panels. Whatever this exact welding method is, it does a magnificent job at holding the Porta-Bote together. With its unique construction and ability to fold and unfold in minutes, this would be an ideal choice to take on local lakes and on trips to remote waters. The boat has a deep V entry hull at the bow that cuts through the water with ease When hitting shallow areas, the Porta-Bote only needs 4 inches of water to float, but the use of oars is recommended at this time rather than your outboard or trolling motor to prevent any damage it may cause to your motor shaft and propeller. Having this ability of moving about in shallow areas will get you to fishing spots others might not be able to reach in larger boats. Because the hull is somewhat flexible, it does take some energy to put the Porta-Bote in motion while motoring or rowing. When using the outboard or oars, our results showed that the flex is so minimal that it’s not a real concern. How stable is Porta-Bote? The stability of the Porta-Bote is actually quite impressive on the water. Even with the Flexi-hull, you would be able to stand up and fish at the same time, but do so with caution. Because only the bow section has a deep V, the rest of the boat is fairly flat with a beam of 5 feet across. Because the hull is constructed out of a copolymer Polypropylene, it takes impact from waves and wakes from other boaters very well. The Flexi-hull absorbs the impact softy, minimizing any roll or instability you might feel such as in an aluminum boat. The design results in an easier and comfortable ride, no pounding waves like a stiff hull, and the feel of stability as you move about the water. Are you worried on Safety: How safe is the Porta-Bote? Virtually unsinkable, explains Sandy Kaye, CEO of Porta-Bote. The Porta-Bote has been designed to stay afloat and leveled even when filled with water. Polypropylene alone is already buoyant, and with the addition of the inner-side foam material and hollow seats plus transom allows even greater floatation. For anglers who don’t like to fish on inflatables fearing they will get a hook in it, well, the Porta-Bote will not have this problem. In addition to the boat being unsinkable, its stability is good and while we fished standing up, we felt completely safe in both calm and open waters. The best part is Portability: Porta-Bote was named with Portability as main tag in mind. The boat is extremely portable and very easy to store. 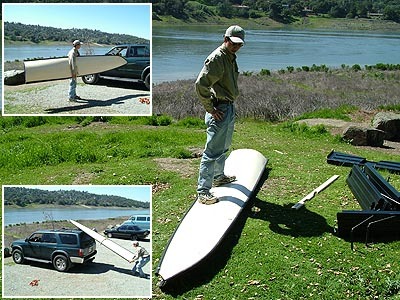 The Porta-Bote Genesis can be folded down to a surfboard size of only 4 inches thick! When folded the Porta-Bote 10′ model can fit on top of sedans, trucks, SUV’s, jeeps, RV’s, planes, and other boats. The boat and the hollow seats are also light enough for one person to haul around, loading, storing, or bringing it down to the launch area. 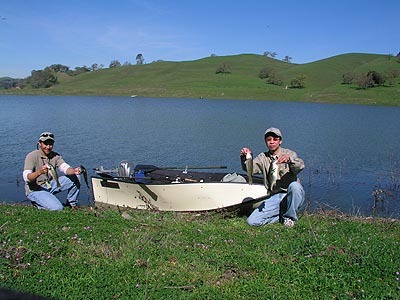 For launching, one can purchase the Porta-Dolly that hooks onto the side of the boat, and in seconds you are wheeling your way to and from the water with all your fishing tackle and motor in one trip. How about the Warranty ? : Not many boats, especially portable ones, come with such a advantageous warranty like the one Porta-Bote offers. Because this boat is extremely durable and the Polypropylene is virtually bulletproof, Porta-Bote provides a 10 year limited warranty on the hull and hinge. Porta-Bote is an Ideal Choice : For anglers who would love traveling to secluded fishing holes far in the countryside, have limited transportation, or minimal storage space but still want a solid hull craft, the Porta-Bote is the one stop answer for all your needs. Don’t forget to check ” More Bargain ” for some good deals on offer. October 3, 2013 in Uncategorized.